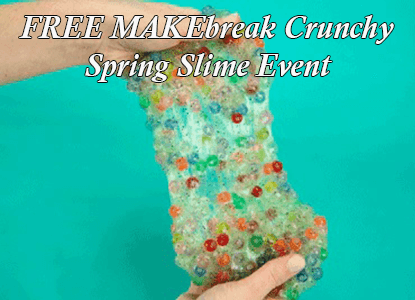 Reminder: Michaels is offering a FREE MAKEbreak Crunchy Spring Slime Event on Saturday, February 23rd from 1:00 pm – 3:00 pm. They will provide the supplies, including premade slime. Mix in colorful pony beads and glitter for a satisfying crunch when you play! We’ll provide the supplies, including premade slime.